A mouse married a lion but regrets doing so when the lion steps on the mouse. It is said that the Mouse spoken of in the last Fable was so emboldened by the offers of friendship made to him by the Lion in return for his assistance, that he asked for the hand of his daughter in marriage. 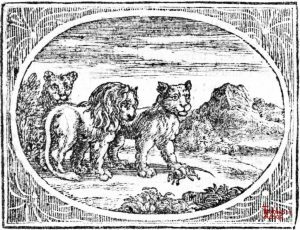 The Lion, amused at the request, good-humouredly told the Mouse he should plead his own cause, and called the young Lioness to come to him. She, bounding forward heedlessly, did not see her little lover, who was running to meet her, and one of her paws falling upon him, he was crushed to pieces. 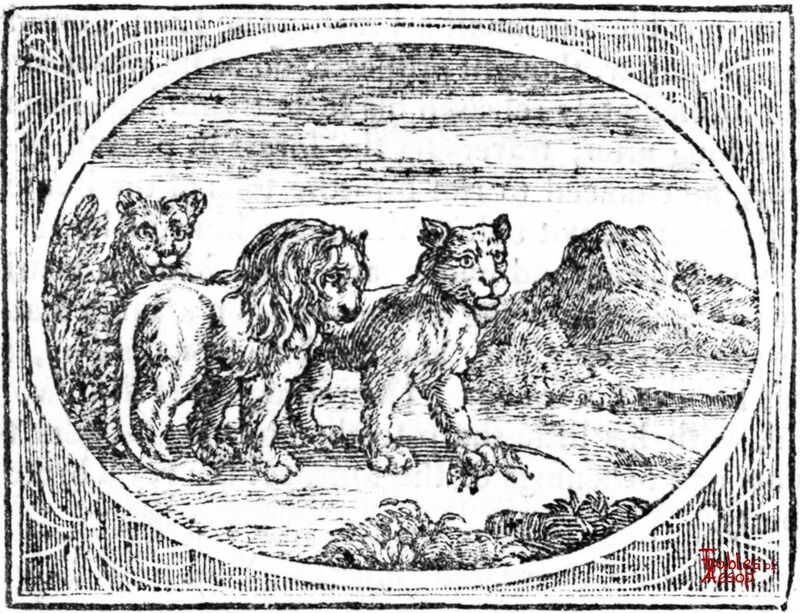 THE Lion aforesaid, touched with the grateful procedure of the Mouse, and, resolving not to be outdone in generosity by any wild beast whatsoever, desired his little deliverer to name his own terms, for that he might depend upon his complying with any proposal he should make. 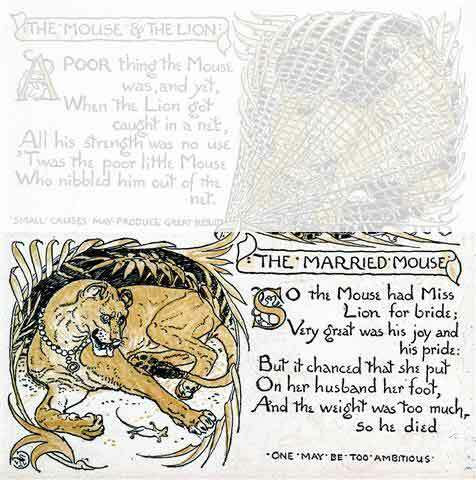 The Mouse, fired with ambition at this gracious offer, did not so much consider what was proper for him to ask, as what was in the power of his prince to grant; and so, presumptuously demanded his princely daughter, the young Lioness, in marriage. 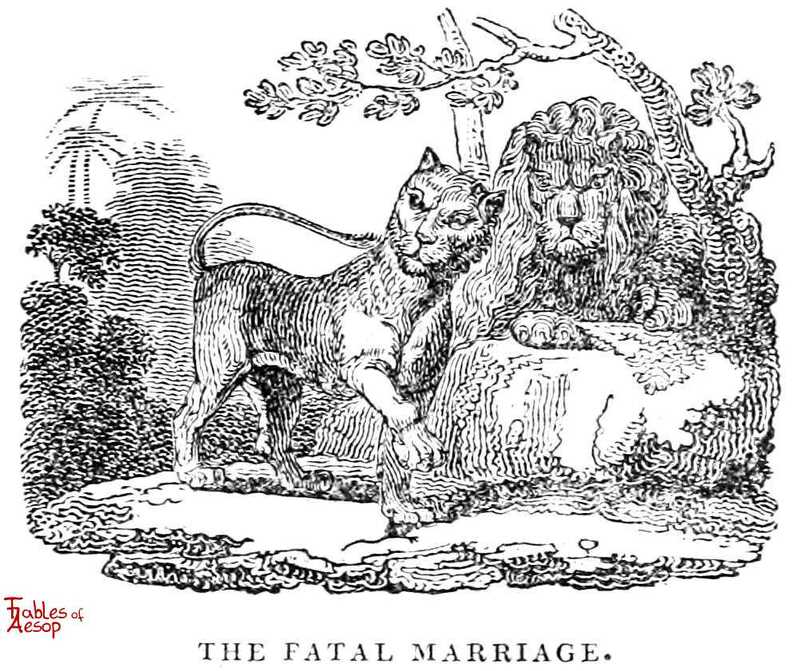 The Lion consented: but, when he would have given the royal virgin into his possession, she, like a giddy thing as she was, not minding how she walked, by chance set her paw upon her spouse, who was coming to meet her, and crushed her little dear to pieces. This fable seems intended to show us, how miserable some people make themselves by a wrong choice, when they have all the good things in the world spread before them to choose out of. In short, if that one particular of judgment be wanting, it is not in the power of the greatest monarch upon earth, nor of the repeated smiles of fortune to make us happy. It is the want of possession of a good judgment, which oftentimes makes the prince a poor wretch, and the poor philosopher completely easy. Now, the first and chief degree of judgment is to know one’s self; to be able to make a tolerable estimate of one’s own capacity, so as not to speak or undertake any thing which may either injure or make us ridiculous: and yet (as wonderful as it is) there have been men of allowed good-sense in particular, and possessed of all desirable qualifications in general, to make life delightful and agreeable, who have unhappily contrived to match themselves with women of a genius and temper necessarily tending to blast their peace. This proceeds from some unaccountable blindness: but when wealthy plebeians of mean extraction, and unrefined education, as an equivalent for their money, demand brides out of the nurseries of our peerage, their being despised, or at least overlooked, is so unavoidable, unless in extraordinary cases, that nothing but a false taste of glory could make them enter upon a scheme so inconsistent and unpromising. And the weight was too much so he died. One may be too ambitious.